There are a number of benefits when it comes to grooming your pet regularly. For example, brushing your cat or dog helps remove dead hair, dandruff and dirt; it also helps bring out natural oils in their fur which ultimately gives their coat a healthy, shiny finish. Not only that, more brushing equals less shedding around your house, furniture and car. Clipping your pups nails is an absolute must, and if you avoid doing so, your dog can go through serious pain, trauma and injury. Overgrown nails can curve into your pets paw causing infection, joint pain and in some cases, permanent damage to limbs. Cavalier pets wants to make grooming fun and easy for you and your furry friends. Grab your set today! A pair of clippers and a deshedding tool ALL IN ONE BOX. Choose between a pink or blue set. Large 4 Inch Head - Makes it easy and take less time to fully brush your pet. Detachable Stainless Steel Comb - Detach the comb with a click of a button to easily clean. Made of stainless steel that won't rust. Non-Slip Ergonomic Handle - Easy and comfortable to hold while brushing your pet. Safety Guard - Prevents over-cutting and injury to your cat or dog. Ergonomic Handle - Perfect feel and comfort to maintain control and precision clipping. Razor Sharp Stainless Steel Blade - Makes clipping your pets nails a total breeze with a single clip of each nail. 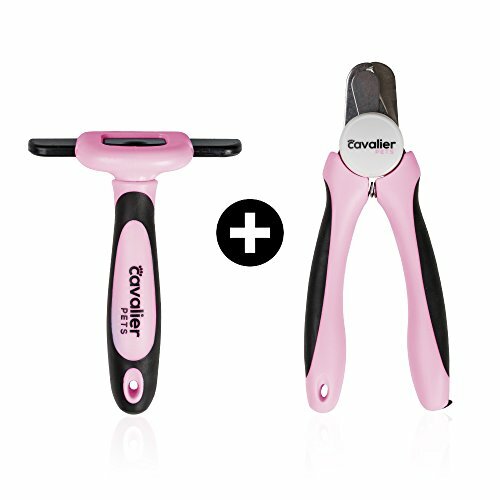 Included Nail Filer - File down those sharp nails after clipping with the bonus nail filer. THE ULTIMATE CAT AND DOG GROOMING SET - This bundle includes a pair of nail clippers and a deshedding comb all in one box. No need to shop elsewhere. Get the necessary everyday grooming tools needed to pamper your furry friends. Reduce shedding throughout your home and keep your pets coat looking healthy and shiny at all times. Avoid infection and pain by frequently clipping your pet's nails. ERGONOMIC, COMFORTABLE AND LIGHTWEIGHT HANDLES - Both nail cutter and deshedder have a non-slip and comfy grip handle. Easy to use and comfortable to hold when brushing your pet. You'll feel confident while clipping your cat or dogs nails with total control and precision, preventing any mishaps or injury. Bonus nail filer hidden the handle of your clippers to smooth out edges. STAINLESS STEEL AND RUST FREE - Our dog clipper and shedding brush are made of high quality, durable stainless steel. The brush has a 4 inch heavy duty stainless steel head which will take less time to full brush your cat or dog. Detach the removable head with the click of a button for easy cleaning and storage. The nail clipper has a razor sharp blade that makes clipping your pets nails a total breeze with a single clip of each nail. SAFETY GUARD PREVENTS OVER-CUTTING OF THE NAIL - The nail clipper has two safety features. #1, a locking mechanism to close the blade in case your little one gets a hold of the cutters. #2, a safety guard which makes it easy and stress free from over-cutting your pets nails. You'll feel like a professional groomer. No bleeding, no injury, no worries. Shedding brush has safety cover to prevent accidents. EXCEPTIONAL CUSTOMER SERVICE AND MONEY BACK GUARANTEE - We are always here to help and make sure you are fully happy and satisfied with your purchase. Buy with confidence with our hassle-free 100% money back guarantee. No questions asked. If you have any questions about this product by Cavalier Pets, contact us by completing and submitting the form below. If you are looking for a specif part number, please include it with your message.